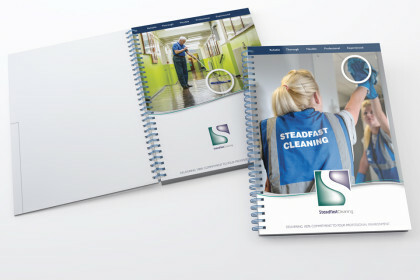 Steadfast Cleaning were looking to grow their business in 2014/2015 and asked us to assist them with their marketing activities. Building on a number of existing successful relationships, mainly with schools, we reviewed their customer acquisition protocol and pinpointed that some printed literature would be helpful in setting them apart from the competition and securing conversion. 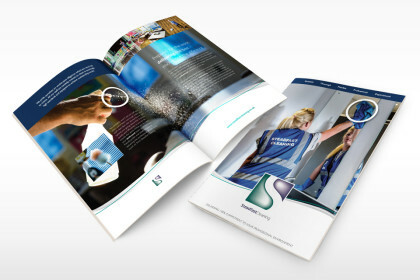 We created a ‘sales’ brochure that outlaid their experience, and in particular, the attention to detail and meticulous approach they encourage their cleaning teams to take. SEA provided a full copywriting service and came up with punchy headlines and informative text to convey the high quality of service. In addition, our in-house photographer attended several school cleaning sessions to record the various cleaning processes and these photographs made the brochure much more authentic than standard library images. We also reviewed their enquiry handling protocol and created a tabbed document to structure and present proposals given to prospective customers. These documents provide a more professional first impression and in our experience, aid conversion. Above and beyond producing literature, we have offered the client pragmatic advice regarding their enquiry handling protocols and customer management and retention, including a customer audit to review and strengthen existing client relationships. Preview the Steadfast brochure on page turning software.